Alan Harrington, known to many of you for his tree walks, spent his professional life studying mosses. He continues to observe them wherever he goes, and has agreed to come to Holland Park 11 a.m.–1 p.m. on Saturday, 4 March, to see what is new since his last walk for us in 2013 when he made some interesting finds. Numbers are limited so please book your place on 020 7602 0304 or on rhoddy.wood@virgin.net. You will need a hand lens of at least 10 x magnification to appreciate fully the beauty and intricacies of these natural wonders. We often get questions about the pigs and cows that arrive in the Arboretum and Oak Enclosure meadows some years. This year there will be no grazing animals. This is because there is little grass but a great many nettles. Nettles are great for pollinators, but animals do not much appreciate them as food. Predominance of nettles occurs when soil nutrient levels are high (all those cow pats!) and the solution is that the growth will be manually cut and removed rather than grazed. Next year the situation will be re-assessed and, who knows, we might have pigs, cows or sheep. Work will start on renovation of the Wildlife Enclosure pond at the end of September. You might have noticed that the water has looked a little murky for a while and the only permanent remedy is to drain and completely re-line the pond: a sizeable task. We understand that water, wildlife and plants will be transferred, for the duration of the works, to the raised concrete ponds in the Oak Enclosure. 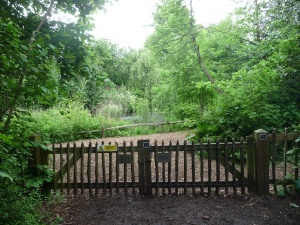 Once the pond is pristine once again, the new Wildlife Area gates can be installed. They have been commissioned and paid for by The Friends, working with Ecology, Park Management and the Parks Police. More on the gates in the winter issue.